Within these capitals lie the three primary components of intellectual capital: human capital, structural capital and relational capital. 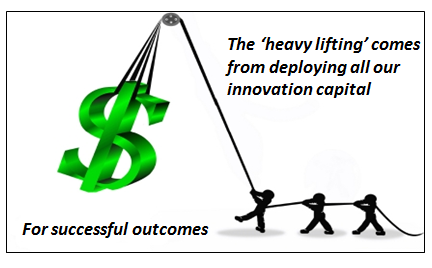 These do the heavy lifting to generate the value in the capital. Human Capital is perceived as the knowledge and learning abilities of the human resources, it primarily as comprising knowledge (explicit and tacit), skills, intellect and talent of individuals. Structural Capital provides the organizational mechanisms and architecture for retaining, packaging, reinforcing and transferring knowledge along business activities. Relational Capital represents a firm’s accumulated knowledge and ability to absorb, exploit and extend knowledge from its relationships to create, develop and maintain conditions that serve the interests of both the firm and increasingly its principal external partners. Technological Capital includes efforts in R&D, technological infrastructure, intellectual and industrial property. Organizational Capital includes elements such as organizational culture, values, attitudes, information and telecommunications capability and organizational structure. Strategic Capital that builds up the layers to offer a viable business, it provides increasingly the logic and purpose that ‘connects and attracts’ and ‘accounts’ for delivering the business model, that provides to the market and delivers on the need to build and sustain the organization and keeps it viable and evolving..
We need to make greater efforts to measure these capitals, as they possess the value of all the knowledge used, combining human with physical capital to generate outputs that drive progress and future outcomes. We are highly vulnerable unless we know what makes up our capital stock. Perhaps a good example here is to think of Apple and its innovation premium. Apple delivers on its innovation promise in products, we, as customers seem to want. They have mastered the convergence of ‘breaking’ technology, placing a significant emphasis on design, user experience,combining materials to deliver products that make that statement of quality, fulfill our increasing appetite for technology we see as increasingly valuable to our daily lives. Then they bundle it by providing ease of use within the make-up of the product, offering closed platforms to enhance individual experiences and deliver this ‘bundle’ through the sheer generation of excitement and buzz. They seem to be able to leverage all their capitals. They build in the emotional capital, the reputation, a trust factor, raising our expectations of a future promise. They are leveraging all parts of their capital stock extremely well, on a constantly evolving platform of knowledge and learning. Can others emulate this combination effect? It is the ‘combination effect‘ of leveraging all our capitals that yields the real lasting sustaining values. Today, we are lost in numbers and details, financials dominate most discussions. Until we can peer under the organizations hood a little more and understand the make up of all the capitals then we will continually fail to understand the real innovation activity that generates the value and we will always have a lack of measuring an organizations performance in any comprehensive way. We rely too much on historical numbers, alongside a judgement of the rhetoric offered by the board about the promise of future performance. Judging innovation’s performance is based partly on current product launches and announced future pipeline where the board is typically cautious. It often make us as those investors equally cautious.We need to know more on what can and does ‘drive’ future performance that lies at its core or is being built in new capabilities and capacities. 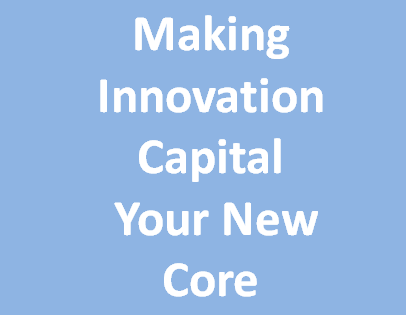 If we had a better understanding of the make up the innovation capital, and what makes up its critical enablers, then we are better positioned to qualify and even quantify a more confident future, based on the capital that ‘feeds’ the future potential. We need to understand the strategic importance of the make-up of the innovation capital and presently most corporate boards lack any clear line of sight into this. It holds innovation back, it constrains growth, it makes us cautious of the future, if we don’t fully understand the make-up of our capital. I think It is time we did. This entry was posted in Uncategorized and tagged hidden assets for innovation, innovation assets and hidden intangibles, Innovation capital, innovation stock, Innovation Structure, intellectual capital, investing in innovation, reporting value adding assets, unique innovation capabilities, Value creative framework for innovation. Bookmark the permalink. Reblogged this on TIM Foundation.